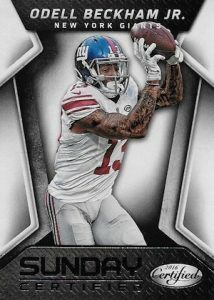 2016 Panini Certified Football returns for another year as one of the first hit-heavy releases of the collecting season. Every box features at least four hits with one being a rookie autograph patch card. 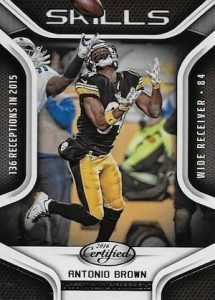 While there will be a base set and multiple parallels, 2016 Panini Certified Football is largely known for the more premium inserts. A staple of the brand, Freshman Fabric Mirror Signatures offer several versions that pair a memorabilia swatch and sticker autograph. Jumbo versions include Mirror Gold Patches and Mirror Black Shield Tags (1/1). 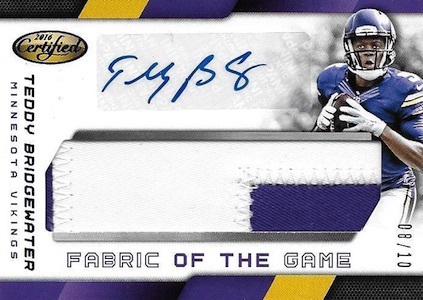 Moving that same concept to the veterans, Fabric of the Game Signatures Prime include a jumbo patch and signature. Gold Team Signatures look to the NFL's elite with a gold-themed design. 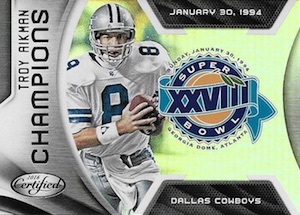 Quality relics are also in the mix with EPIX Victory Super Prime which showcase a quad die-cut memorabilia display. 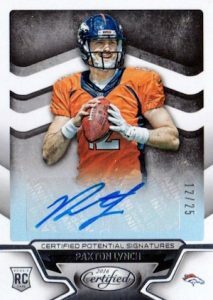 Additional hits in 2016 Panini Certified Football include the main Mirror Signatures. Giving collectors the details they have long asked for with their memorabilia cards, Certified Gamers Materials specify the game where the relic swatch originates and even include the game picture of the player wearing the exact jersey. 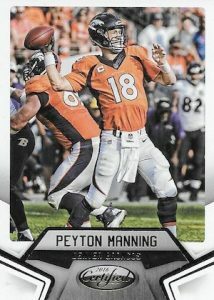 Sending off "The Sheriff" in style, the Peyton Manning Collection presents collectors with multiple relics and autograph relics for the retired legend. A total of five designs look back at his time with the Denver Broncos and all cards are numbered to 25 or less. JARED GOFF 2016 PANINI CERTIFIED ROOKIE AUTO AUTOGRAPH PATCH RC CARD #4 99! Base Immortals #/999, Base Rookies #/999. PARALLEL CARDS: Mirror #/499, Mirror Orange #/225, Mirror Red #/99, Mirror Blue #/50, Mirror Gold #/25, Mirror Purple #/10, Mirror Green #/5, Mirror Black 1/1. PARALLEL CARDS: Orange #/349 or less, Red #/249 or less, Blue #/50, Gold #/25, Purple #/10, Green #/5, Black 1/1. View specific parallel options with full spreadsheet. PARALLEL CARDS: Red #/60, Blue #/40, Gold #/25, Purple #/10, Green #/5, Black 1/1. PARALLEL CARDS: Mirror Red #/99, Mirror Blue #/50, Mirror Gold #/25, Mirror Purple #/10, Mirror Green #/5, Mirror Black 1/1. PARALLEL CARDS: Mirror Orange #/149 or #/99, Mirror Red #/99 or #/75, Mirror Blue #/50, Mirror Gold #/25, Mirror Purple #/10, Mirror Green #/5, Mirror Black 1/1. PARALLEL CARDS: Red #/75, Blue #50, Gold #/25 or #/15, Purple #/10, Green #/5, Black 1/1. 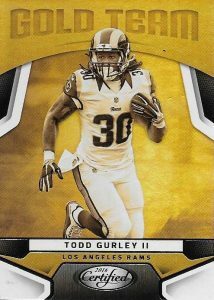 PARALLEL CARDS: Game #/50 or less, Season #/25 or less, Moment #/5 or #/3, Victory Super Prime 1/1. PARALLEL CARDS: Prime #/49 or less. PARALLEL CARDS: Prime #/49, #/10 or #/5. PARALLEL CARDS: Mirror Black 1/1. PARALLEL CARDS: Mirror Red #/75, Mirror Blue #/50, Mirror Gold #/25 or #/15, Mirror Purple #/10, Mirror Green #/5, Mirror Black 1/1. All subjects not included in Blue/Red parallels. View specific options with the full spreadsheet. PARALLEL CARDS: Orange #/399, Red #/299, Blue #/50, Gold #/25, Purple #/10, Green #/5, Black 1/1. 3 cards. Serial numbered #/25. PARALLEL CARDS: Signature #/10 (Only card #1,2), Prime #/5, Signature Prime #/5 (Only card #1,2). This product does not have no where near enough players from each team. Too much of one team and not enough of another. I won’t buy this product. I bought 2 boxes from the same Hobby Store and received 3 Redemption Cards. I hate Redemption cards, however I could have accepted 1. I felt like I spent $200 and walked away empty handed !! I waited for a Aaron Rodgers 2014 Atomic Black Auto 1/1 for 2 years, although it is one of the nicest cards in my collection now. Read the reviews on this product and i have to say the same thing with the guy who gave it a 4. My deal with the this product or better yet my beef with this product is with the cost for per box. But as the guy said worth it, you will get your money back easy, and just a fun box to break. Just opened 2 Hobby box. Got a my mony back in no time. Pretty Happy, and got 5-10$ of the regular set completed. 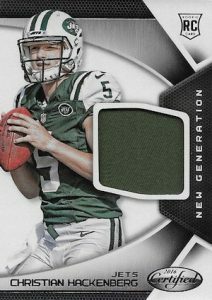 Hey Trey what is a better brand to go with panini 2016 certified NFL or Panini 2016 prism NFL I don’t know what one to pick ? I think the design is outstanding and the best part about this product is the value. Each pack yields at least a serial numbered card. I have only opened one box and pulled an Emerald Leonte Carroo autograph /5, relics of Will Fuller, and Sterling Sheppard, and a Doctson patch autograph. I even pulled a Wentz and Elliott gold team. I am from the UK and really love this collection. I brought in 4 cases of 12 boxes before Christmas from the USA and got some lovely cards in them. Emmitt Smith 1/1 Gold Team Signature and Brett Favre 2/10 Gold Team Signature. I have a lot of spare cards if anyone is interested.